A new synthesis method for resveratrol analogues, resveralogues, has been published by researchers at the University of Brighton. The method utilises a simplified one-pot synthesis which is stereo-selective and produces high yields with minimal purification. Resveratrol has been identified as being a promising substance in anti-ageing therapeutics and its analogues are of great interest for this area. Using this new method the authors have been able to synthesise both well known and novel resveralogues. The author list consists of our very own Dr Lizzy Ostler; her PhD student Vishal Birar; a recent graduate of our Pharmaceutical & Chemical Sciences degree Jana Milkovicova, who did some of the work whilst she was here as an undergraduate; and two colleagues from the biology division Professor Richard Faragher and Dr Angela Sheerin. The work shows just how integrated our students are with the research undertaken in the department and how beneficial the multi-disciplinary department we work in can be. Read the paper “A facile, stereoselective, one-pot synthesis of resveratrol derivatives” at the open access Chemistry Central journal here. 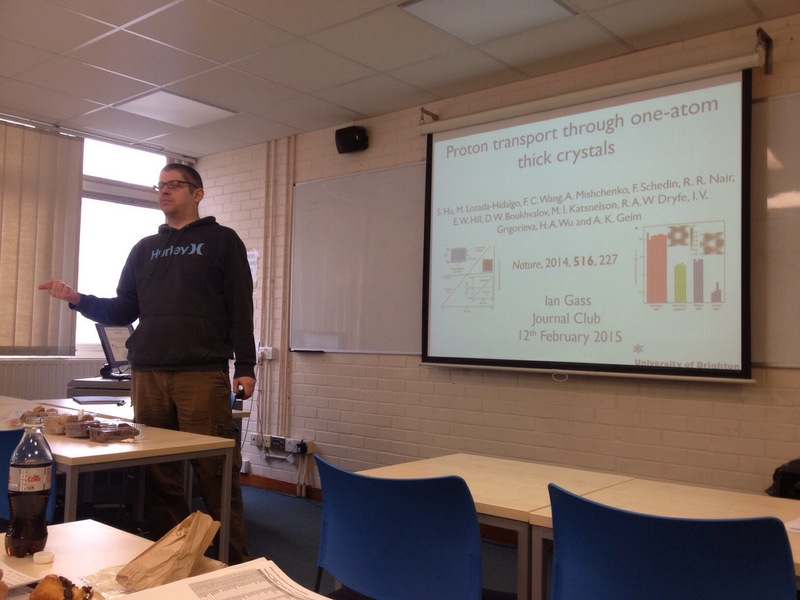 The first session of the Chemistry Journal Club kicked off with a slightly left field paper on proton transport through graphene. Not a traditional chemistry article and surprisingly, given our host for the session, not a metal in sight either. Ian skilfully managed to convince the audience that protons could quite conceivably travel through the little tiny gaps in the graphene structure and introduced us to hBN. Discussions ensued as to the possible useful applications and all went away pondering how it fits in with life, the universe and everything. Many thanks to Ian Gass for hosting the first session and introducing us to something that we may well have never picked up otherwise.